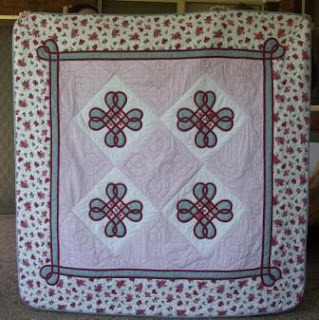 I come from a large family and since I started quilting have given most of my family members a quilt. One of the first quilts I gave to my mother, was from the first quilting class I did. It was a 2 day class in May 2002, with Michelle Marvig using bias tape and machine applique and I fussy cut some of the flowers. Both new techniques to me at the time. I then hand quilted hearts with a thick red pearl thread, and walking foot quilted the outer braid border, - also firsts for me. My mother has used this quilt on her bed since then and it has been washed many times. Fortunately the colour from the backing fabric no longer runs. It now adorns the bed in her nursing home so doesn't receive any special treatment when washed. Darling quilt! This quilt must be your mothers favorite. Isn't it fun going back and looking at our work and how far we have come from the first quilts we have made??? Just think, you now have a ribbon to be proud of and look were you are at now.